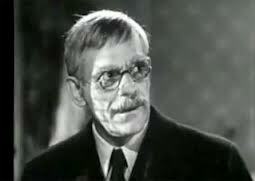 Synopsis: Dr. Bernard Adrian (Boris Karloff) is widely disliked by his small town neighbors. The locals have few rational reasons for their hostility. Dr. Adrian keeps to himself, but when dealing with his neighbors he is civil enough. Nevertheless there is a general feeling that doesn't belong, and the distinctly vague complaint that he "experiments too much". 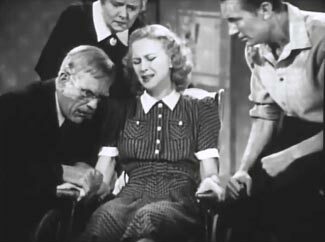 The one person in town who adores Dr. Adrian is Frances Clifford (Maris Wrixon), a young woman stricken with polio. Dr. Adrian dotes on her like his own daughter, and this causes resentment from Frances' jealous jerk of a boyfriend Danny (Gene O'Donnell). Dr. Adrian has been experimenting with the spinal fluid of animals, and he believes he is getting closer to perfecting a serum that will cure those who've been stricken with polio. At about the same time, a circus comes to town, and Dr. Adrian encourages Danny to take Frances to see it. Late the same night, an ape badly injures its trainer and escapes from the circus. The trainer is brought to Dr. Adrian's surgery, but it is clear that the man has little chance of survival. Soon Dr. Adrian has created a human serum and he begins to treat Frances with it. The serum causes great pain to her legs, which alarms Danny, but Dr. Adrian sees this as an encouraging sign, since the paralysis had left her without any feeling in her legs whatsoever. Meanwhile, the ape, which is still on the loose, kills another man, and Dr. Adrian must sign the death certificate. Frances' reaction to the spinal fluid treatment is encouraging. While the pain in her legs is growing worse, she is able to move her foot a little -- a clear sign that Dr. Adrian's treatment is working. Late one night the ape breaks into Dr. Adrian's lab. Dr. Adrian is able to kill it but not before it smashes his vials of serum. He decides to keep the ape's death a secret. Soon the county coroner comes to visit Adrian. It seems the two victims of the ape were both found to have puncture wounds in the spine -- as though Dr. Adrian had injected something into the men -- or extracted something. Comments: Dave Sindelar (of Fantastic Movie Musings and Ramblings fame) says that the ending to this movie nearly brought him to tears when he was a kid. And that might be the nicest thing anyone's ever said about it. The Ape is certainly a better movie than Monster a Go Go, tonight's second feature. But nearly every film can safely make that claim. No matter how much goodwill I bring to watching The Ape I find myself periodically checking my watch. And the movie is only 57 minutes long. Curt Siodmak wrote the screenplay, but there's nothing to tip you off that he worked on it aside from a preoccupation with spinal fluid. Say what you like about Siodmak, he was a solid craftsman, but for whatever reason - most likely a poverty-row insistence that good money ought not to be wasted on frills like second drafts -- the script isn't even competent. There are plenty of plot holes and general nonsense to be found here, but I think the biggest problem is the character of Dr. Adrian himself. Not only does he violate the laws of God and man in his quest to procure spinal fluid for young Frances' serum (we expect that; it's a given for the mad scientist subgenre) but he abandons all common sense along the way. Dressing up like a gorilla doesn't do him any good unless somebody sees him (the gorilla costume doesn't give him the strength of an ape, it just makes him look like one); and if somebody sees him they're likely as not going to shoot him (Dr. Adrian's final tally while wearing the ape suit: shot three times, stabbed once). Had he skulked around as Dr. Adrian, he could have dreamed up some excuse for doing so if caught -- looking for the gorilla, for example. That's what the rest of the yokels are doing out in the woods in the middle of the night. Even setting this aside, what was Dr. Adrian going to do, once he has strangled someone out in the woods in the guise of the gorilla? Why, insert a needle into the base of the skull and withdraw spinal fluid, of course. That an autopsy would quickly discover this never seems to occur to Dr. Adrian, even though autopsies revealed exactly that in both of the previous two victims. How would he explain that? "Oh, I was walking out in the woods and this fellow was lying there, dead. So...."
As long as Dr. Adrian is acting irrationally, why not murder Frances' jerk boyfriend Danny, whom he at least has a reason to kill? For all Dr. Adrian's avuncular kindness to the young girl, I'm not entirely convinced his motives are as pure as he lets on. So murdering Danny would be a more interesting plot development than strangling some unsuspecting townie. Aside from one William Henry Pratt, a.k.a. Boris Karloff (who could probably play these sorts of roles in his sleep by this time), this film features the lovely Maris Wrixon as Frances. Wrixon was an up-and-coming actress on the Warner lot who never quite made it as a star, and she spent more time loaned out to Monogram than she ever did at the studio that actually signed her contract. After Warner dropped her, she quickly vanished. But she was a winning presence here, as she was in another Monogram mad scientist picture, the John Carradine vehicle The Face of Marble. Synopsis: A Mercury space capsule returns to Earth far off course, landing in the Illinois countryside. Dr. Chris Manning (Peter Thompson) and Dr. Steve Connors (Philip Morton) are dispatched by NASA to recover the vehicle. They find that it was badly damaged upon re-entry and contaminated with massive amounts of radiation. 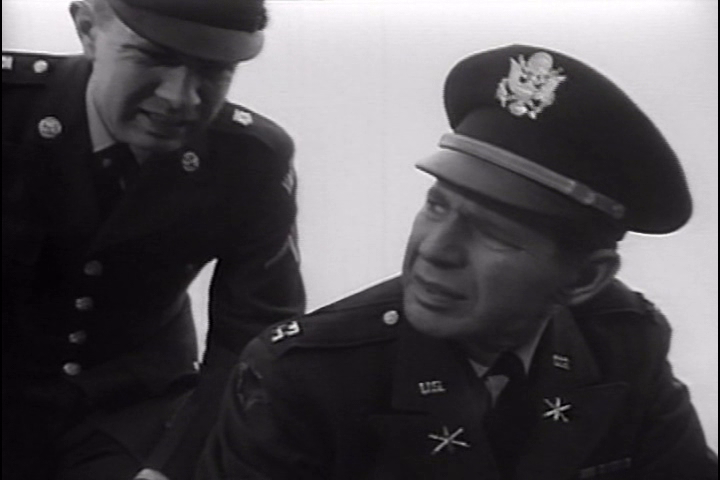 The astronaut, Frank Douglas (Henry Hite), is nowhere to be found. Before long, reports of a ten-foot tall creature wearing a silver suit begin to filter in. The thing is wandering across the countryside, leaving bodies and destruction in its wake. Manning and Brent quickly realize that this is Douglas, irradiated and apparently mutated into some kind of monster. Dr. Conrad Logan and his assistant, Dr. Nora Kramer (Losi Brooks), try to work out what has happened to Douglas. They determine that the emits a field of deadly radiation around it that extends out about 10 feet. The field is gradually growing, and if the creature isn't stopped the field will grow to hundreds of feet in diameter. This is especially troubling since the monster is making its way toward Chicago. Dr. Logan manages to capture the creature and gives it doses of an anti-radiation drug. But it breaks loose and heads toward the city. The civil defense forces manage to corner the thing in the sewers of Chicago. They pursue it, but what can they do, even if they manage to corner it? Comments: You would think a movie about the hunt for an astronaut-turned-radioactive-monster that's shambling through the woods, killing teenagers while they make out in their cars, would be at least mildly interesting. But Monster a Go Go is about as exciting and suspenseful as a how-to video about drywall installation. 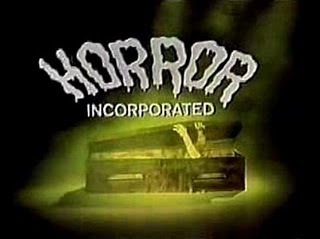 The movie is an almost unwatchable mashup of terrible footage shot by Bill Rebane (the clueless, utterly talentless director of The Giant Spider Invasion) and unrelated scenes added by the sharp-eyed exploitation director Herschell Gordon Lewis (I previously posted a review, if you're interested). The title Monster a Go Go was apparently Lewis', and it might be the best thing about the movie; along with the opening credits, which show the mutated astronaut's silver boots stomping along, superimposed over a starry background, as rock-n-roll thumps and twangs away in the background. It sets a tone to which the movie seems to aspire, but never achieves: cool and trippy, a waking dream informed by all the square sci-fi movies of the past. Handled right, it could have been a clever and arty and slightly subversive romp. But the counterculture had not yet seeped into science fiction films, and wouldn't until the 1970s, when indie films like Dark Star, Zardoz and A Boy and His Dog began turning up in cinemas -- movies filled with irony and antiheroes and downbeat endings. In any case, Rebane's material isn't even competent on its own terms; and Lewis, though at least able to discern what a drive-in audience might like, isn't interested in anything more than showing some horny teenagers in danger. In the end, what Rebane contributed was beyond anyone's ability to redeem. He had apparently never heard the phrase "show, don't tell" in relation to screenwriting, and his scenes are painfully static. Without fail the most interesting incidents occur offscreen, and we only hear about them third-hand as characters stand around and endlessly drone on about them. Never has a movie worked so hard to drive away its audience. I thought of adding something about the movie's daffy and nonsensical ending, but it hardly seems worthwhile. I suspect very few people who started watching this turkey made it all the way to the end. 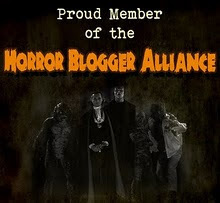 Let's just assume that no who one saw this one on Horror Incorporated got that far. 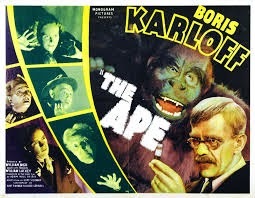 Monogram switched Boris from Mr. Wong to THE APE to conclude his six picture contract, but his lone Poverty Row horror ranks right down there with Bela's THE APE MAN, another scientist hung up on spinal fluid (only one measly weasel of a murder victim for the feeble minded Adrian). Maris Wrixon was indeed a fine actress, but I thought that the ease with which her character rises from the wheelchair was indicative of a rushed and botched climax. 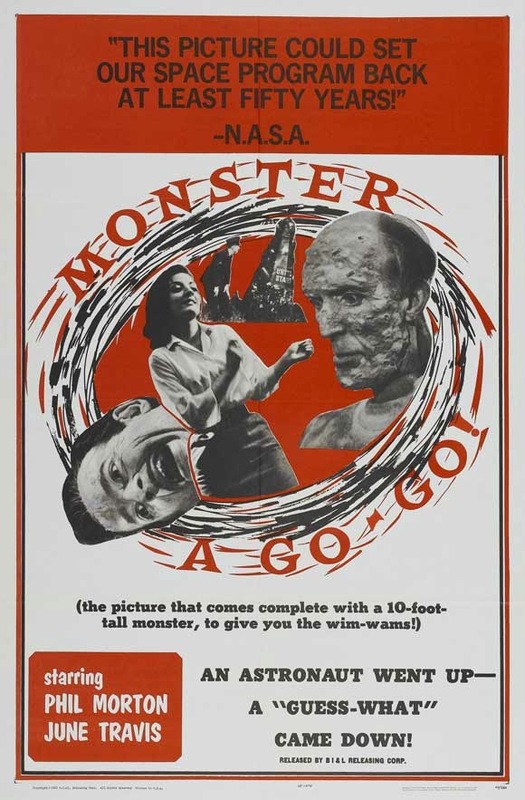 MONSTER A GO-GO was a film I encountered only once, in 1979, rarely screened and with good reason!